My last day, day 21! I had a great night’s sleep. We even got to sleep in a bit. Felt good. I just had an apple and a pear for breakfast this morning. Being the space cadet I am, I forgot to take a picture. I had another giant salad for lunch. 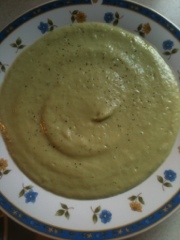 Dinner was avocado and cucumber soup and roasted vegetables. The soup was OK. I couldn’t eat it all. It just wasn’t my cup of…soup. Budump bump. The veggies were great. How could they not be? If you ever have a bunch in your refeigerator and you don’t know what to do with them, chop them, drizzle with olive oil, spice them up to your liking, and place in oven. Ta da! This 3 week journey is sadly over. I am a weirdo and I like to have my days planned and written down for me. This was a very strict three weeks. I enjoyed it very much. It was not difficult, I never cheated, and I never wanted to quit. Do you know how much better I feel? I can’t even describe this to you. 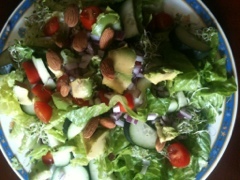 I have been eating a plant based (Vegan) diet for three weeks. I feel like my insides are shining, sparkly clean, and happy. You are what you eat! So very true. You eat crap, you feel like crap. I have learned so much. How to cook food I have never tried before and new ways to cook the food I love. I appreciate the colorful fruits and vegetables so much more. I never felt like I was missing out on anything. I loved eating all of this food. I mean, there was a ton of food! Now, don’t think that tomorrow my first meal is going to be bacon and eggs, some pizza for lunch, etc. That doesn’t even sound good. I have to slowly incorporate foods back into my diet. Such as dairy, eggs, and whole grains. This will be a great way to see how my body tolerates this food. 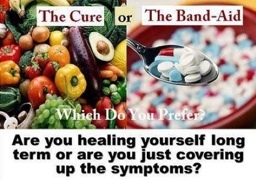 If something that I consume doesn’t make me feel right I will cut it out of my diet completely. An easy process of elimination. I lost 12 pounds during the Reset. I plan on doing my measurements tomorrow morning before I WORKOUT! I am so excited to get down there again. I will be starting month 3 of P90X 2 and running 3x per week. Day 20! One more day to go! I am not excited that this journey is just about over. I have to say I am very proud of myself. This took a ton of commitment and learning, but I am so much better off now. I will go into that more tomorrow. WARNING Speech coming soon. I started off the day with a pear, peach, and an orange. After I was half way through scarfing it down, I realized I forgot to snap a picture. Oops. Lunch was a BIG salad. 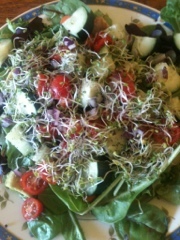 Mixed baby greens, tomatoes, sprouts, cucumbers, avocado, red pepper, and some red onion. 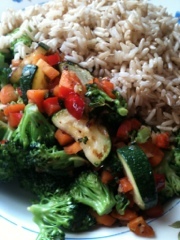 Dinner was a whole bunch of veggies sauteed in coconut oil and brown rice. So, it’s Friday and I plan to go to bed early and sleep in a bit. Maybe fall asleep to Golden Girls. Sounds perfect. I am such a loser. I loved my breakfast this morning. A peach, pear, kiwi, and an orange. I am THE breakfast girl and I give this one two thumbs up. 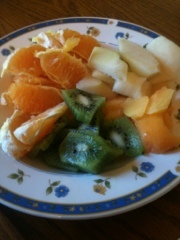 I highly recommend starting your day off with a big plate of fruit. God didn’t give us some sugary, processed cereal. He gave us beautiful fruit, so eat it! 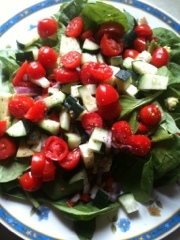 Lunch was a gigantic spinach salad topped with avocado, red peppers, tomatoes, and cucumbers. So good. 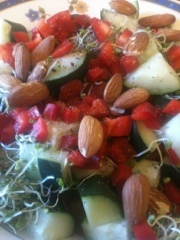 What are your favorite salad toppings? Dinner was quickly thrown together. 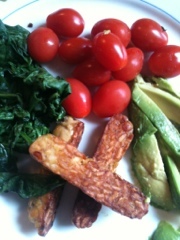 I cooked up some tempeh, steamed some spinach, threw some tomatoes on my plate, and sliced up some avocado. Quick, easy, healthy, and delicious. 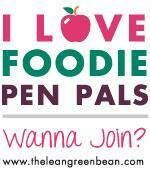 My challenge group begins Monday, so if you want in, then speak up now! It is day 18. Time has certainly flown by. 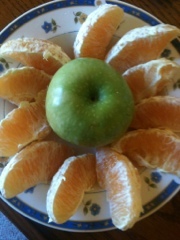 Breakfast was an orange and a granny smith apple. I am so grateful we have a granny smith apple tree right in our backyard. Come on fall! Lunch was delicious. 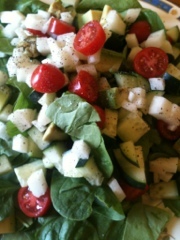 A spinach salad with tomatoes, avocado, and jicama. 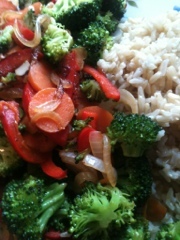 Dinner was some veggies and rice. 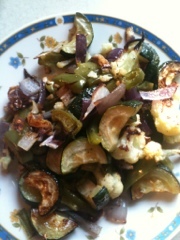 How do you cook your veggies? I love frying them in coconut oil. Try it! I have learned so much and I want to share everything with you. I want you to feel as good as I do. I want you to appreciate your food. I will be starting a challenge group soon. It will be focused on clean eating and working out. If you are interested, please contact me either here or on my Facebook by tonight. You have nothing to lose but some inches and bad habits! Start now! Day 17! Holy cow! I feel like I have all of my energy back. You know how I start my day by now. 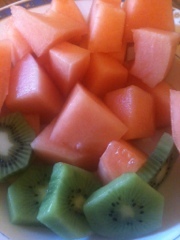 With a fresh fruit plate of course! Lunch was rather strange. My least favorite so far. 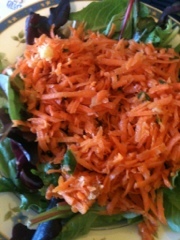 Moroccan carrot salad on top of baby greens. I wasn’t too crazy about the flavor, but I ate it anyway. Dinner was super yummy! 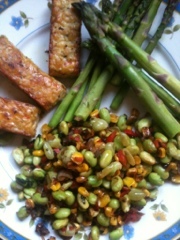 I had tempeh, corn and edamame succotash, and steamed asparagus. I have been doing great these past few weeks. I have not cheated, much less craved anything besides chocolate Shakelogy (just ordered a new bag yesterday) Want some? I will hook you up. But, if i see that dang Dairy Queen commercial with the new confetti cake blizzard, I may cry a little. Lunch was…you guessed it! Another microgreen salad. Am I sick of these? Nope! Dinner was something new. 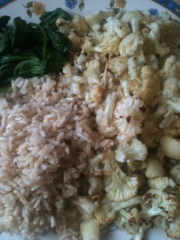 Roasted cauliflower, steamed spinach, and brown rice. Oh my, this meal was super good. The recipe called for cury, but I chopped up some garlic and squeezed some fresh lemon on top instead. Good day today! Total weightloss so far is 10.5 pounds. I am already thinking about Sunday, when I am done with the Reset, I can’t wait to start my third month of P90X2 and have a big old chocolate Shakeology shake! I miss that the most. It’s getting warmer out there! Are you ready for your summer wardrobe? As a Beachbody coach, I have had the honor of helping people set and reach their fitness goals. I have been thinking of starting another challenge group. We would focus on clean eating and daily workouts. 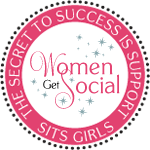 We would set up a private facebook group and I will provide motivation and guidance. So, if you are ready to learn, workout, and change habits then this challenge is for you! If you are interested, please visit my facebook and send me a message. I will be waiting to hear from you. Have a great evening! Big breakfast today. 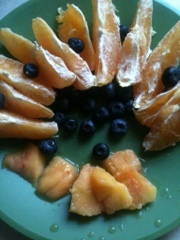 A gigantic orange, blueberries, and a peach. 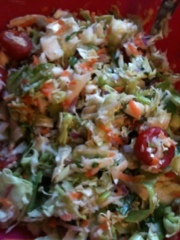 Lunch was an Asian Cabbage Salad. Was too big for me. I couldn’t eat it all. I know, shocking. 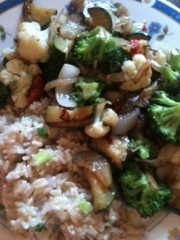 Dinner was garlic veggies and brown rice. I got a little walk in today. My little guy and I went visiting. He got to mess up two more living rooms today. Happy Mother’s Day! Mother’s have the toughest job in the world. They deserve extra special love and attention today. I wouldn’t be the person I am if it was not for my mother. She’s not only my mom, she is my best friend. I love her to the moon and back.